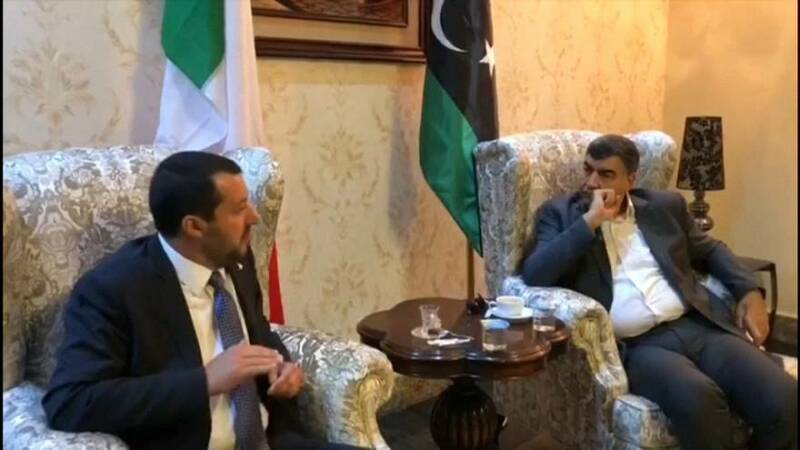 Italian interior minister Matteo Salvini has proposed on a visit to Libya setting up migrant reception centres at the north African country's southern borders. In a bid to stem the flow of migrants across the Mediterranean into Italy, the immigration hardliner wants to cut them off before they reach the coast, but did not say in which countries such centres would be located. Salvini said: "As the European Union funds 3.3 billion euros, to defend the eastern borders around Turkey - which is not a European country - from our Libyan friends there is the same request, for an equally concrete intervention where migrants depart. So we are not talking about Libya, but we talk about the countries to the south [of Libya]. The news comes at a time when two rescue boats laiden with migrants, the Lifeline and Alexander Maersk, are stranded in the Mediterranean with nowhere to dock. Salvini said: "Let's see if Europe remembers to exist, since there is still a ship full of migrants in the Maltese waters, which obviously waits to be welcomed and, we reaffirm - with all the respect of the world - it will be welcomed in a port that is not Italian." Over 11,000 migrants have arrived in Italy so far this year. However, Italy's ruling populist coalition has shut the door anymore arrivals, leaving boats floating without a port.